It's pretty easy to dismiss the "check engine" light as just stupid, because, well, it is. I suppose if you thought that the cause of smoke coming from under your hood had something to do with the floor mats, then, sure, the "check engine" light is handy, but beyond that, it's useless. But that's not the real problem. The real problem is that the "check engine" light is a tool for the propagation of consumer ignorance about their cars. Which is why it needs to die. Now. If it sounds like I'm making a big deal out of this, it's because I am. 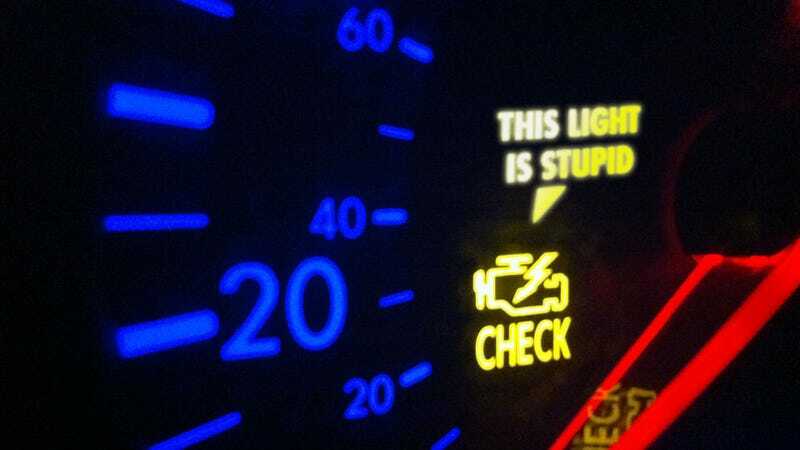 The continued use of a generic, uninformative "check engine" light in cars keeps car owners in the dark about the condition of their vehicle, and ensures they stay dependent and subordinate to car dealers and mechanics. The frustrating thing is it doesn't have to be that way. Let's look at exactly what the "check engine" light does in a car, and how it works. To understand it, first we need to understand what On Board Diagnostics (OBD) are — I know for many Jalops this is review, but bear with me. Every car sold today has an on-board computer system that monitors many, many sensors and conditions in a car's drivetrain, and reports back when there is an error. This has its roots, of all places, in the 1969 Volkswagen Type III, one of the first cars with electronic fuel injection. The "electronic" part of that meant that there was a crude computer brain that managed the system, and could scan for error conditions. Other manufacturers soon had their own systems, and by 1996 an actual, standardized system, called OBD-II, was developed and mandated by law for inclusion in all cars sold in the USA. OBD-II is actually a terrific system. A global standard for helping to diagnose car issues, with standard connectors and error codes? What's not to like? What's not to like is that when something goes wrong, all the average motorist sees is that little drawing of an engine bisected by a lightning bolt. And all that tells them is basically nothing. The "check engine" light is the MIL (Malfunction Indicator Light) of the OBD-II system, and illuminates whenever a fault is detected. To see exactly what sort of fault takes a "special scanner" that plugs into the OBD-II connector. These scanners are almost always owned by mechanics or dealers. Independent people can buy scanners as well, or cables to connect laptops, smart phones, etc., but people who will do that are not the ones who need to worry about the check engine lights. My mom, for example, is never going to be able to connect her laptop to the OBD-II connector somewhere under the dash in her Passat; it's hard enough explaining to her how to connect a printer to her Mac. If her Passat just told her what codes were being thrown, she would at least have an idea about the condition of her car. "We need a federal mandate that bans the generic 'check engine' light in new cars." But better yet — the state of things now is that your car actually could do more than just throw an error code at consumers. It contains an advanced system to diagnose itself, but the actual information from that diagnosis is not available to the car's owner; the average owner must pay a dealer or mechanic to provide him or her with the codes, and what those codes mean. This is absurd. Early on, when in-dash displays were rare, one could understand why cars didn't just display what codes were being thrown (though I think a little in-dash receipt-type printer would have been cool). But today's dash displays capable of displaying text, or at a minimum numerical codes, have been commonplace in cars for at least a decade. Now, pretty much every new car has some sort of alphanumeric display that could show both OBD codes and a short English description, but no manufacturer does this. I've heard of some cars over the years that employed weird, Nintendo-cheat-code-like procedures to display codes (I think Neons had something with turning the car on and off rapidly in succesion) but nobody does this by default. And they should. There's no good reason not to. By not letting the car's owner know what's going on in the engine, a regular driver, one who may not be particularly interested in cars, is entirely beholden to a paid professional to get hidden information from a machine they own. That goes against the great Owner's Manifesto and puts the owner in a very vulnerable position if a mechanic or dealer was dishonest. I think — nay, I hope — most are honest, but without good information on both sides, how can a given owner know? And why should they not know? Or what about this: if your resources are tight, and you rely on your car to work, and the "check engine" light comes on, you'd have no way of knowing if it's indicating a massive repair or a minor sensor issue. You'd have to guess, either ignoring it and hoping it's nothing, or taking it to a shop and hoping you'll be able to pay for whatever the repair turns out to be, a repair performed by a for-profit enterprise based on information you as an owner have never seen. Making valuable information about a person's own property inaccessible only enables uninformed judgement and the possibility of fraud. Basically, the generic "check engine" light makes it easier for dishonest mechanics to take advantage of unknowing customers. Considering other car features that are federally-mandated — like tire pressure sensors and airbag warning lights — wouldn't adding one to actually help the consumer make sense? It may be the only type of federal-required feature that makes sense. Which is why we need a federal mandate that bans the generic "check engine" light in new cars and instead requires, on dash, OBD-II codes and a basic description. The only rational reasons it hasn't happened yet range from a best-case scenario of simple manufacturer desire to build as cheaply as possible, to an actual deliberate campaign of forced ignorance in order to keep dealer network profit streams. Neither of those reasons — or any in between them — are valid or acceptable. Our cars need to tell us exactly what they're thinking, even if we have to yell at NHTSA to make a rule to make sure the manufacturers do it. Do I have to stand outside of the grocery store getting signatures to make that happen? Maybe. But it'll be worth it.